Tempura is a very popular Japanese dish of different meats, seafood and vegetables deep fried in a light and crispy batter. Unlike many other deep fried foods, tempura is very light, so vegetables are often used as well as prawns or other seafood. 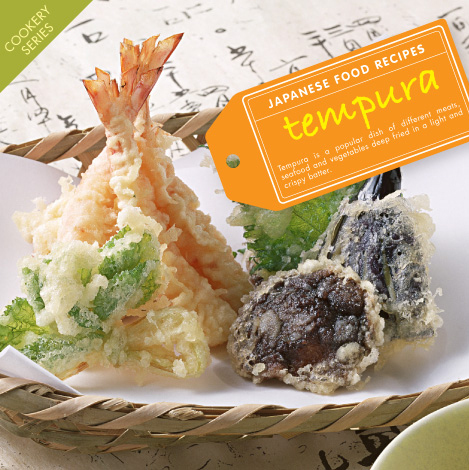 Most of the ingredients needed for tempura can be purchased at any normal supermarket, but Japan Centre stocks the all-important tempura flour. Just follow the links next to the ingredients to add to your online shopping basket. Please feel free to leave any tips or suggestions in the comment section at the bottom. • Optional Ingredients: Tsuyu mixed with water for dipping! • Note: You can also try making tempura with any other vegetables or seafood. 1. Begin by cutting all the ingredients into small strips. This helps them to cook faster. 2. Make sure that all the ingredients are dry and kept in the fridge prior to cooking. 3. Heat up approximately 2 inches of oil in a pan to 160-170°C, or use a deep fat fryer to regulate the temperature. 4. Mix 120g of tempura flour with 200ml of ice cold water to make the batter. The colder that you have the batter and ingredients before frying, the lighter and crispier your tempura will be. 5. Dust the ingredients with a little flour, then dip into the batter and cover completely. 6. Drop the battered ingredients into the oil immediately and cook for a few minutes until the batter turns golden and crisp. Serve straight away to enjoy the maximum flavour! We sell a lot of the fresh ingredients directly in our shop in Piccadilly, so you can print this recipe and even bring it to the foodshop to find everything that you need for a tempura party! Tempura is one of my favourite Japanese foods!